Nucleophilic bimolecular substitution (SN2) is the general reaction for primary and secondary haloalkanes (alkyl halides) where the halide functions act the leaving group, and the nucleophile is the species that replaces it. Alkyl halides are organic molecules containing a halogen atom X bonded to the carbon atom which is an sp³ hybridized. They can be primary, secondary, or tertiary depending on the number of carbons bonded to the carbon with the with halogen. This is exactly the most important factor in determining the course of its chemical reactions. SN2 reactions generally occur in the presence of polar aprotic solvents. The primary alkyl halides are undergoing the SN2 reaction, regardless of solvent. But with secondary alkyl halides is more difficult to achieve than with primary. It is possible if we use as a nucleophile a weak base (cyanide ion or alcohol). This reaction does not occur with tertiary alkyl halides because the nucleophilic attack is disabled due to the steric hindrance. 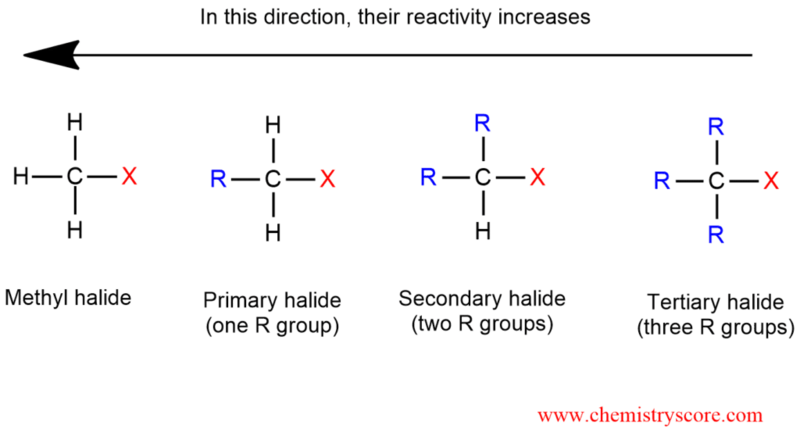 The SN2 reaction is stereospecific and always takes place with inversion of configuration. The nucleophile attacks the alkyl halide from the opposite side of the leaving group (backside attack) and the overall reaction is the one-step transformation. All the bond formations and breakages occur simultaneously. No intermediate is produced, but there is a transition state in which the nucleophiles and the leaving group are partially bound to the same carbon atom (indicated by the interrupted lines). The rate of any SN2 reaction is directly linked to the concentration of two species. The reaction is bimolecular and both the alkyl halide and the nucleophile appear in the rate equation. This means that if you double the concentration of either, you double the reaction’s rate. If you cut the concentration half for either, the rate will also cut in half.